RUSH: Righto. Here we are. Here we go. The same thing. It’s the same thing over and over again. What do we do? We have to get up here and we all have to get busy defending something because the left is on the march. Rinse and repeat, 30 years it’s been like this, 29 years. Left gets on a tear, gets on a roll and you gotta stand up and defend and point out how they’re lying about everything. They’re constantly marching forward on their agenda, but I’ll tell you something, folks. As I look at these leftists and media people and Democrats, as I listen to them talk about gun control in the aftermath of the Las Vegas massacre, I’m seeing no innovation. I’m seeing nothing but old talking points rehashed, fear tactics and so forth, but no innovation. Nothing new from these people. They are not modernized. They have not adapted. Now, there’s a downside to that. The downside is that they’re consistent, and that their message is consistent, and therefore people have heard it so many damn times that each incident comes along and they get to add on or pile on and people, “Yeah,” nod their heads maybe. Yet, on the other hand, the fact that they’re not innovating in their attempts to move their agenda offers additional opportunity to stop them and oppose it, at least as far as I’m concerned. Greetings, Rush Limbaugh, great to have you again standing up for America and defending her against the never-ending assault and corruption of the left. It’s 800-282-2882 if you want to be on the program. The email address, ElRushbo@eibnet.us. We’re now into that area now where facts do not matter. They never matter to the left. But the danger is that the whole thing has become an emotional issue. You can’t blame people for reacting to this emotionally. But reacting to it emotionally and dealing with it emotionally are two different things, and the left wants to continue dealing with everything emotionally so that facts and reality can be ignored. There’s an additional aspect of this. Now that the media, the Drive-Bys and the rest of the Democrats are sure that the Vegas shooter was not an Islamic terrorist, they are taking off the gloves. I mean, they are, with reckless abandon, moving forward. They were holding back a little bit, waiting for confirmation the guy was not a militant Islamic terrorist. If he had been a jihadist, the Drive-Bys would be preaching to us about how we must not blame all Muslims and how we must guard against a backlash against Muslims. But since he was just a regular old, maybe wealthy gun owner, all bets are off. HERRIDGE: A U.S. government official tells Fox News investigators are doing a full review of Stephen Paddock’s travel history. They’re drilling down on his financial transactions as well as his personal relationships looking for unusual activity or a sudden dramatic event that points to motive. ISIS has released a new video this morning tying itself to the attack, though the FBI continues to discount that international terror connection. I must confess, it is a rather brilliant catch that here in less than, what, two days, law enforcement, government agencies can tell us with slam dunk ontological certitude there was no terrorism in this, no militant Islamic terrorism, but even after a year with no evidence whatsoever, they still claim that the Russians colluded with Trump and vice-versa. So since there is officially no connection to Islamic Jihad, the Democrats see a clear road straight ahead. The media are going completely crazy over the idea that the shooter may have used an automatic weapon. Now, for those of you in Rio Linda, you probably know that an automatic weapon is a machine gun. How many people wonder, how many people do you think, when they read or hear about this, and they keep hearing the reference to automatic gun, automatic weapon, how many of ’em don’t know what it is? It’s a machine gun. And semiautomatic is not automatic. Now, here’s a little interesting factoid that is floating around areas of the media concerned with fact, and that is that legally owned, fully automatic weapons have been used in exactly three crimes since 1934. Three. Meaning, automatic weapons are not proliferating. Meaning, automatic weapons are not the problem here. The guy is the problem. The shooter is always the problem. The NRA and everybody now under siege, “We’ve got to get rid of automatic weapons.” Automatic weapons have only been used three times in crimes since 1934. They’re not the danger that the media and the Drive-Bys would have you think they are. And they’ve been illegal since 1934. What is happening now, and what they think they found, they found some bump-stocks among this guy’s collection. A bump-stock is a modification that turns, like an AR-15, it simulates automatic fire. It is a stock, that for lack of a better way of explaining this, is almost spring loaded. The recoil as you fire, the recoil on your shoulder pushes the gun forward, which keeps your finger pressure on the trigger, which makes automatic fire. It isn’t automatic. It’s simulated automatic fire at the end of the — I mean, it is firing faster than a human being can manually pull the trigger, but it’s modified to do so. When it was first discovered that the guy was using automatic weapons up there, the reaction was, “Where? You can’t get them. Only the military has these things. They’re machine guns. Where did he get them? And they cost through the nose if you do find one.” As I say, only three used in criminal activity since 1934 since which they’ve been illegal. And everybody was saying, “My God, where’d the guy get one?” You just can’t walk in the store and buy one. They’re illegal. They’re very hard to get. But bump-stocks are a modification tha, if you know what you’re doing, you can put a bump-stock on your weapon and it simulates automatic fire. So now they’re looking at bump-stocks and thinking, “Well.” And the NRA doesn’t defend the stuff. The NRA doesn’t defend automatic weapons. The NRA is not out there saying everybody ought to have one. They don’t have a vulnerable position on this, but that doesn’t matter because we have long since gone past the fact based aspect of this. You want to hear another little fact? AEI, American Enterprise Institute, has a chart here that records American gun ownership and the American murder rate with guns since 1994. Since 1994, gun ownership has increased. Privately owned firearms has increased by 56%. The gun homicide rate has declined since 1994 by 49%, meaning more guns does not mean more murder. More guns has meant less murder. 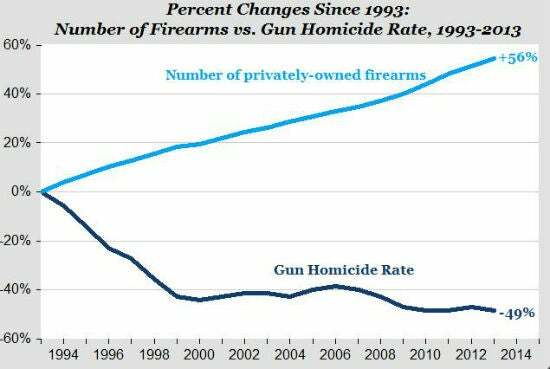 Again, since 1994 the number of privately owned firearms has gone up 56%. I don’t have total numbers here, but it doesn’t matter for the purposes of this. In that same period sense 1994, gun homicide rate annually has declined 49%, it’s almost equal. As the number of guns have increased, privately owned guns have increased, so has the murder rate decreased. But this won’t matter. This is like offering them facts to countermand what they believe in climate change. It’s automatically discounted, not believed, and they say you’re making it up or it’s irrelevant or you’re mixing apples and oranges or you’re a bigot, pervert, pig, what have you. Well, whatever it takes for them not to believe you and do what they can to destroy your credibility. So this is where we are. Once again, the Democrats have an agenda item that they have been salivating over for 40 years or longer, and that is taking guns out of the hands of law-abiding people, because, by definition, you can’t take guns away from criminals. They’re not gonna give them up. And if they do, they’re just gonna restock. So gun control would only get rid of guns among law-abiding people, who, by definition, are not the problem. But none of this fact base, none of this logic-based reasoning — in fact, no reasoning at all matters. It will not hold up against the emotional onslaught. Late-night comedians are now practically crying. 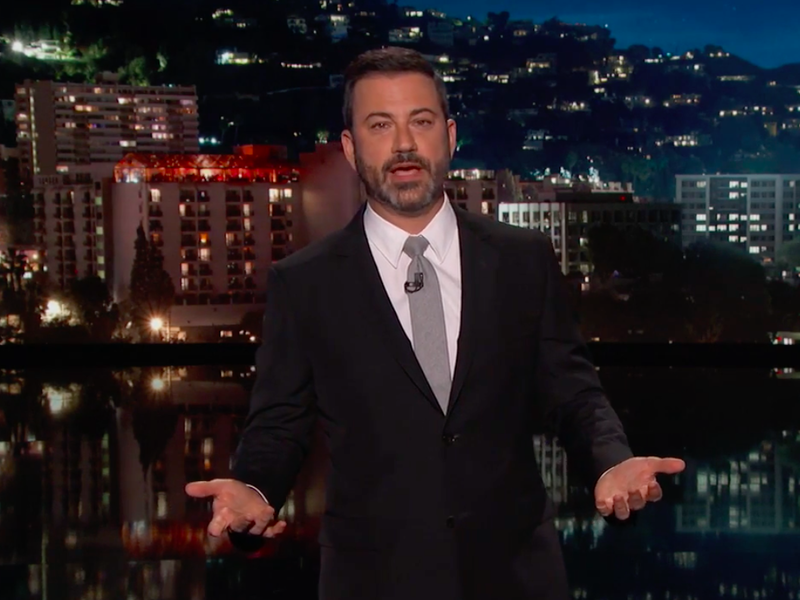 You know, once Jimmy Kimmel got some fame and notoriety for his expertise in health care, all the other late-night comics are trying to get in on the act. And now last night all became experts on gun control and murder and crying. And it’s just part of the onslaught that we are facing now. And there are questions. I bring this up, when I read about it today, frankly it had not occurred to me, but there are some people on the Trump side of the aisle who are worried that he might cave to people on this. Do you know why? Because of the deal he made with Chuck and Nancy on the debt ceiling and all that, and he got praised by the New York Times, and he was lauded, and he liked it, so he might do it again, is the fear. RUSH: There’s a lot we want to get to today, including audio sound bites illustrating where the Democrats are on this and what we are up against as once again the American the media and Democrat Party join forces to attack, again, the Constitution of the United States. RUSH: We now ask a question that we ask every time we go through this exercise. What new law would have stopped Paddock? Somebody tell me. Everything he did is already illegal, including killing people. Everything he did is already illegal. So somebody tell me what new law would have stopped the shooter? Well, don’t waste your time. There isn’t an answer. There is no new law that would stop this. There is no new law that would have prevented this. For example, we have laws that say you can’t kill other people. You can’t kill anybody. If you do it premeditation, if you do it with hate, we’re really gonna get you, but you can’t do it. He killed 59, wounded 500 others. What law can we pass that would have stopped him? Well, maybe security checks at hotels, but that’s not a gun control law. I’m asking what new law on guns could we pass that would have stopped Mr. Paddock from getting his weapons and firing? Everything he did is already illegal. The Wynn in Las Vegas is already screening guests. Its already started. It adds, according to the initial reports, 10 minutes to the check-in time to get into the Wynn Las Vegas. You know this is gonna happen. But that’s not gonna satisfy the left. They’re not even talking about that. They want guns out of the hands of law-abiding citizens. RUSH: Let’s review what we know here. It’ll set some other things up. Mr. Paddock, the Vegas shooter, illegally modified weapons to make them automatic, used bump-stocks. This news, by the way, from anonymous sources. We don’t really know for sure, but we’ll run with it since it’s the latest. A bump-stock is hard to describe how it works, but essentially it bumps up against your shoulder, the stock bumps up because of the recoil. And the bump, it’s spring loaded, moves the gun forward, you keep your finger behind the trigger, and the pressure of the gun moving forward hits the trigger and it simulates automatic fire. It’s not a machine gun. You can modify other guns to do this. It takes more than the bump-stock to be modified, but the bump-stock is what uses the recoil to cause pressure to be constant on the trigger. And it simulates automatic fire. The guy spent a ton of money, I mean, 19 guns in the room, 12 guns in his Mesquite, Nevada, home, ammo out the wazoo. Apparently he was okay financially, but he had much gambling debt. He had cameras deployed so he could monitor law enforcement officers if they observed his position. It was a suite. It was probably a high roller suite. The guy spent so much money gambling and lost, he might have even been comped. It might have been a suite for the whales at Mandalay Bay. I’m just guessing. But it’s a two-bedroom suite so those windows could easily have been one hotel room. I don’t know what a big deal, two rooms or not, but I wanted to address that. So the left’s out calling for new gun laws, but there’s not a single new law that would have changed what happened. There’s not a single new law affecting, impacting guns that would have changed what happened. As I said, there have only been three mass shootings, three crimes since 1934 to have used fully automatic firearms. Think machine gun. The reason for that, it’s very hard to get them, and they are expensive. In addition to the expense of the weapon, you have to get a Class 3 federal firearms license and the tax stamps on the weapon. All of this takes time, a lot of bureaucracy and a lot of money. The federal tax stamp on a full automatic weapon pre-1986 manufacture is a minimum of $10,000, plus the insurance that you have to have to cover theft and possible use of your stolen automatic weapon. These are not things that you find even on eBay. If you find them anywhere, they’re gonna be on the dark web somewhere. We’re dealing with an idiot, a nut job, a wacko here, and if one of these people is determined and well-funded, it’s difficult to stop. Intellectual Takeout: Why Are There So Many Mass Shootings Today?